Let me weave you a tale, or tell you a yarn, about the Beijing "Bird’s Nest"
I too was wondering what the birds nest building reminded me of…then I thought about a Martin Puryear woven wood sculpture. Couldn’t find an appropriate example, but I’m satisfied with that association. 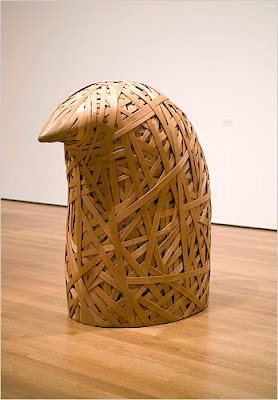 Martin Puryear is one of my favorite living sculptors. I’m not always sure why. I like the mystery in his forms. The anthropomorphism that has been handmade into something greater, through abstraction. The spiritual power when he passes traditional arts and folk traditions and wisdom of Africa and other lands through his being and through his hands and into his work. His political/historical power can punch, as in the soaring “Ladder for Booker T. Washington.” I love it set against the concrete walls in Tadao Ando’s Modern Art Museum of Fort Worth. With elegance and earthiness Puryear turns craft work into deep art. A handmade work in our industrialized society is born with mojo. When I spent a day a few months ago with the architects of the “Bird’s Nest,” Jacques Herzog and Pierre de Meuron, they spoke of that. They hail from Switzerland. A land with centuries-long traditions of hand work. That led to the famous Swiss craftsmanship of timepieces. But they said that today, little is made by hand in Switzerland. They spoke of a recent trip to Kenya where they saw some craftsmanship, but a dwindling amount. And then, I’m just remembering now, Herzog mentioned India and China. He said they may end up as the last places on earth where things are still made by hand. 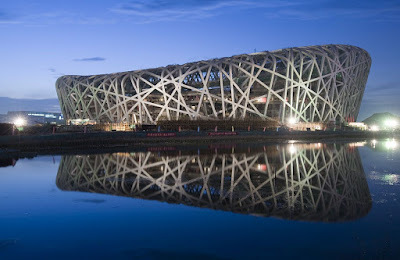 Which makes me wonder if their “Bird’s Nest” stadium is an homage to the hand-made. It does look beautifully woven, crafted- like a Martin Puryear. a ball of yarn? Look like the photo at the top? There it’s much less effective. The manic energy sinks it, as does the dated feel of graffiti as inspiration in New York City. I like how he creates space, architecturally. It’s womb-like, with mystery and meaning in it. The “Bird’s Nest” also achieves this. And its form is enough like a whale to keep us looking at it in a satisfied way until we can figure it out its meaning. The “Bird’s Nest” too can look like a tail fin, reentering the ocean. What Puryear has created gives off an animate power and yet would also be a carcass, or is it the ribbed infrastructure of a ship? It’s a rot, a ruin. 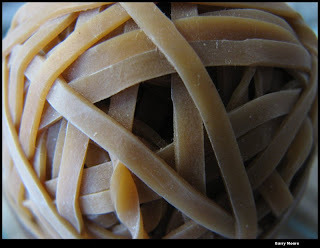 The “Bird’s Nest” shows a melt-down tendency too. 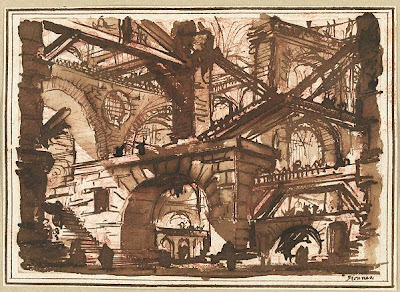 Do you see the romantic ruins of Piranesi in it? A crumbling of the old order. 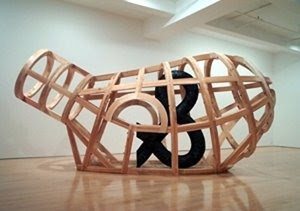 Martin Puryear uses wood in so many different ways that he renews its possibilities as artistic material. Herzog and de Meuron are doing the same for steel. 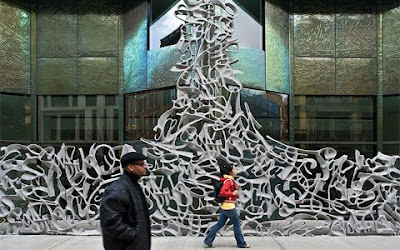 We once again see the relationship of architecture and sculpture. Many public buildings today get criticized for being too sculptural. In Beijing, Herzog and de Meuron get the balance between architecture, sculpture, craft and message just right. You are currently browsing the archives for the Puryear category.